Drain chickpeas and add them to a processor with the eggs. Pulse to combine, but not until smooth. Some texture is good. Dice peppers, onions, garlic, and jalapenos. Add veggies to skillet along with a few drizzles of olive oil over medium-high heat. Cook until soft, about 4-5 minutes. Add spices to vegetables and cook for another minute until spices are fragrant. Let veggies cool for a minute, then mix in with egg/chickpea mixture. Add lemon zest, oats, and bread crumbs to the mixture. Let mixture sit for 15 minutes so the oats and bread crumbs can absorb the liquid. Form into 8-10 patties. If the mixture won't stick together well, add a bit more bread crumbs or oats until it's dry enough to stick. Grill Patties on a very hot grill for about 4 minutes a side. Feel free to add cheese and any other toppings you would normally add to a burger. 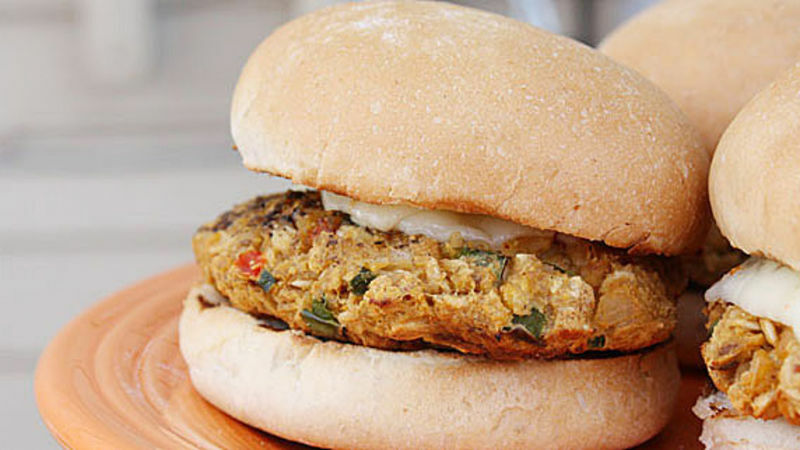 Never eat another boring veggie burger ever again. It’s hard to get excited about a frozen brick of vegetables in patty form for dinner. But a homemade veggie burger that’s packed with seasoning and fresh veggies? Now we’re talkin’! At first glance, this burger recipe may seem like it has quite a few ingredients, but most of them are seasonings you likely have in your spice cabinet. If you’re looking to up the flavor, go heavy on the jalapenos and the red pepper flakes. If you like your veggie burgers less spicy, feel free to omit the red pepper flakes. This recipe makes eight to ten burgers so it’s an excellent recipe to make in a batch and then store and freeze for later. To freeze the patties, place a layer of patties in a container and cover with parchment paper. Then add the next layer on top. Store in an airtight container and place in the freezer. If you’re hosting or mastering the grill, and everyone else wants a beef burger, we’ve got those too!